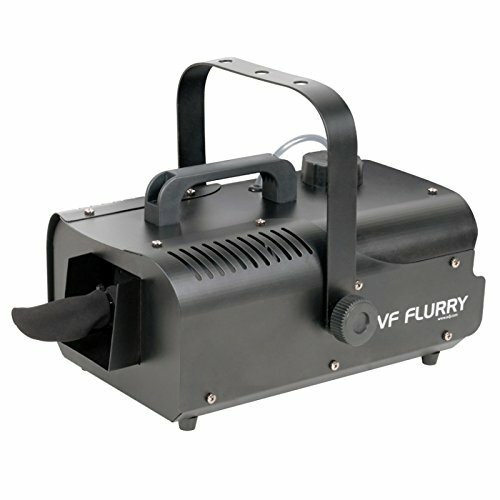 The VF Flurry is a highly efficient, 600W Snow Machine. It has a spray distance of 2-5 meters. Features include: Low/High volume selection switch, low snow fluid shut off to protect the pump, snow fluid level indicator, 1 Liter internal snow fluid tank, and an On/Off switch on the rear panel. The VF Flurry uses water based snow fluid. This package also includes (1) 8oz Bottle of Ultra Dry Snow Concentrate from Froggys Fog. When mixed with water it makes a full gallon of snow fluid. Other VF Flurry Specifications: - 600W mobile Snow Machine - Spray distance: 2-5 meters - Volume selection switch: Low or high snow output - Low snow fluid sensor to protect pump - Internal snow fluid tank: 1 Liter - Fluid level indicator - Includes wired remote - On/Off switch on rear panel - Uses water based snow fluid - Dimensions (LxWxH): 340x255x200mm - Weight: 3.8 kg.